We are seeing aphids in winter grazing. I saw an abundance of Bird cherry-oat aphids in a field of oats and a lower number in another field. The warm weather we have had has contributed to high aphid numbers. The bad thing about them is that they cause direct feeding damage and can transmit Barley yellow dwarf disease. 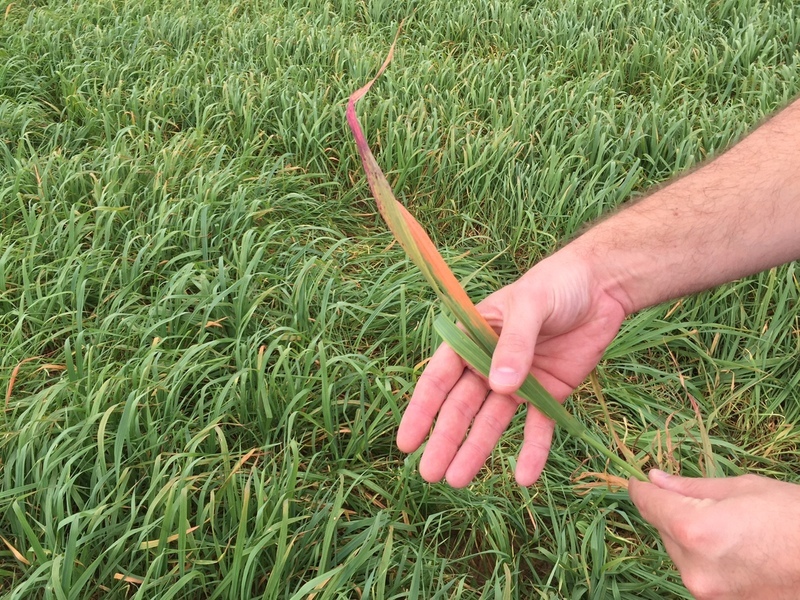 Symptoms in wheat vary from yellowing to reddening or purpling of the upper leaves beginning at the leaf tips and extending backward toward the base. Symptom color varies with the variety and may be similar to those caused by nutrient imbalances. Here’s some Barley yellow dwarf on oats that Decatur county agent Kyle Brown and I found today in another field of oats being grown for grazing. . The reddening starts at the tips and is usually in the top of the plants and in spots. Aphids were present in this field as well. I think 2015 was definitely one of the worse peanut white mold ( Sclerotium rolsfii) aka southern stem rot, years in history. High heat and frequent cloudy rainy periods caused it to be worse than usual. It was definitely a year that premium white mold products paid off. Here’s some comments from Dr. Bob Kemerait, UGA Extension Plant Pathologist, concerning white mold this year and what we can do. Why do I have so much white mold in the field and did I get ANYTHING from my fungicide program? Answer: I have been asked this question again and again, over and over this season. First, here are a few things to remember. The 2015 season has been very favorable for white mold, pushing all of our fungicide programs to the limits of performance. No program, no matter how much you spend, can control all disease in a field. I think 75% control may be all we can get sometimes. Couple warm temperatures with dry conditions and our dryland fields are, well, you know what I mean. Without rain or irrigation to wash the fungicides to the crown of the plant, performance and control are reduced. Our huge peanut acreage must mean that some of our fields are on a short rotation. 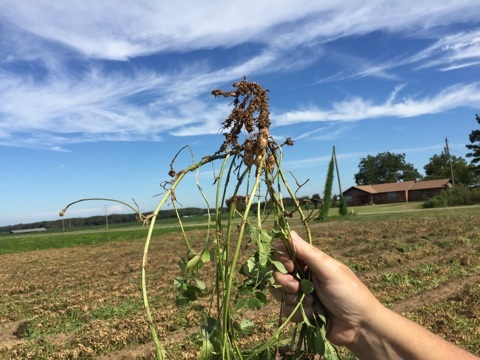 Short rotation, hot temperatures and perhaps over-reliance on tebuconazole because of low peanut prices all add up to a white mold “field day”. How do you know if your white mold program worked for you? If you look out in a field and see a number of white mold “hits” you are likely to be disappointed. However, if such “hits” are contained to a one, maybe two plants and do not extend in streaks down the field, then you can be confident that your program was engaged and fighting for you. Also, if finding active white mold is difficult, then you can also be confident that your program was working for you. Note, however, that managing underground white mold is especially difficult because of getting the fungicide to the target below the soil surface. Underground white mold is difficult to control, even under the best of circumstances. Control may be improved with timely irrigation or rainfall, or by spraying the crop at night. Is there anything I can do now to prepare for disease management in peanut next season? Answer: Yes, there are several things. First, do your best to increase the number of years between peanut crops in a field. Second, identify the diseases that have been most problematic in your field and work with your county agent to develop a comprehensive management plan to include choice of variety and fungicides. Educate yourself on fungicides that are available now and those, such as Elatus, that will be available in 2015. 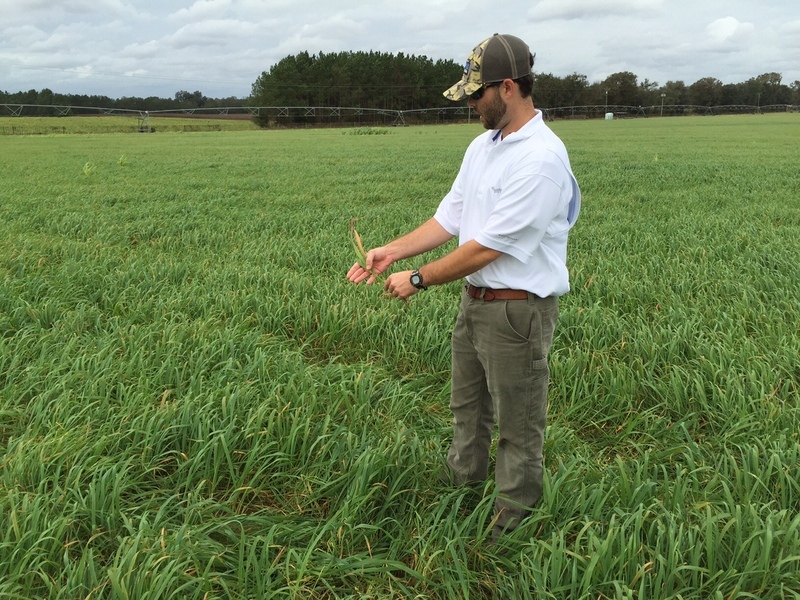 Lastly, consider taking nematode samples and preparing for nematode management in 2016 with resistant varieties (Tifguard and Georgia-14N). Also, note that our current predictions are for a strong El Niño this winter, bringing increased rainfall and cooler temperatures. 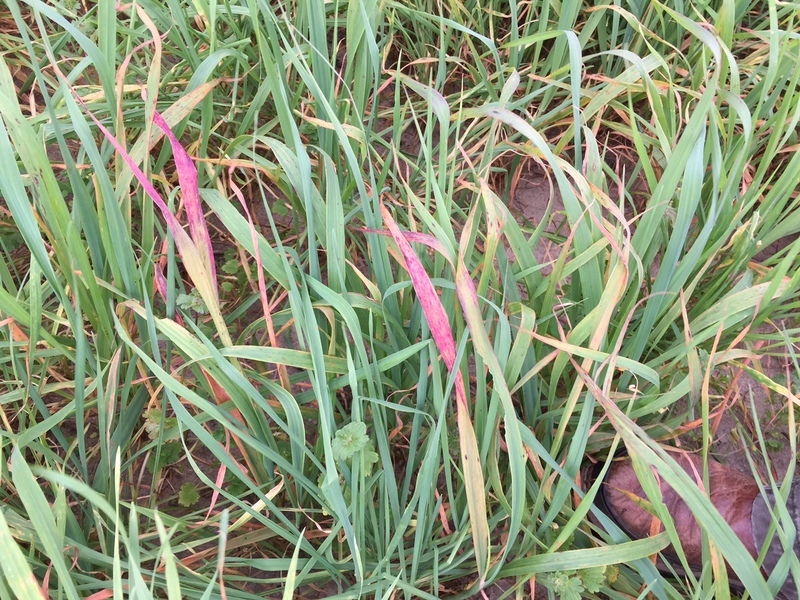 Growers should anticipate how such will affect disease management in all of their crops to include delays in planting or in application of Telone II. It’s a good time to evaluate peanut fields here at harvest. Just after we dig our peanuts is a good time to evaluate our nematode control. Sometimes we see that we have peanut rootknot nematode problems in a field that we didn’t have a problem in before. It is important to note this so that the next time we have peanuts or a susceptible crop in the field then we can take action to prevent yield loss due to this pest. 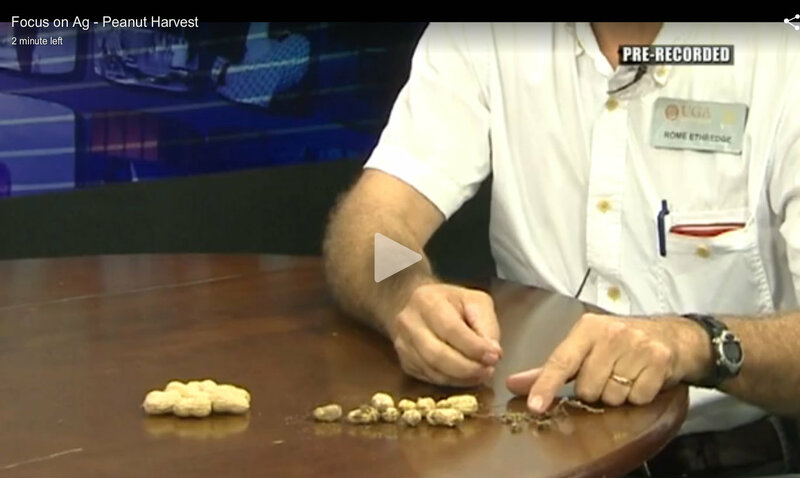 I recently recorded a TV spot where I talk about peanut nematodes. Since this was my last scheduled appearance on the “Focus on Ag” segment on WTVY 4 in Dothan , I thank them for doing a good job covering Ag stories and promoting Ag awareness. I’ve been talking about Agriculture on WTVY for over 20 years starting with Gene Ragan on his farm show. Click on this link below to see the video. http://up.anv.bz/latest/anvload.html?key=eyJtIjoiZ3JheSIsInAiOiJkZWZhdWx0IiwidiI6IjMzMDY3MjgiLCJwbHVnaW5zIjp7ImRmcCI6eyJjbGllbnRTaWRlIjp7ImFkVGFnVXJsIjoiaHR0cDovL3B1YmFkcy5nLmRvdWJsZWNsaWNrLm5ldC9nYW1wYWQvYWRzP3N6PTY0MHg0ODAmaXU9LzMwMTcyMTcxNS9XVFZZJmNpdV9zenMmaW1wbD1zJmdkZnBfcmVxPTEmYWRfcnVsZT0xJnZwb3M9cHJlcm9sbCZlbnY9dnAmb3V0cHV0PXhtbF92YXN0MiZ1bnZpZXdlZF9wb3NpdGlvbl9zdGFydD0xJmNvcnJlbGF0b3I9W3RpbWVzdGFtcF0mY21zaWQ9Mjc5NSZ2aWQ9QU5WX0dSVFZfMzMwNjcyOCJ9fSwiYW5hbHl0aWNzIjp7InBkYiI6MzY0MTI2MzV9fX0“>Click here to see the video. We sometimes in the past have seen lesion nematode, Pratylenchus spp.,effects on peanut pods. It was a cosmetic deal , they just looked spotted with very small spots on the pods. Our main attention and concern was and still should be on the peanut root knot nematode, Meloidogyne arenaria. This year I’ve seen peanuts from at least 3 fields however that seem to be adversely affected by lesion nematode. 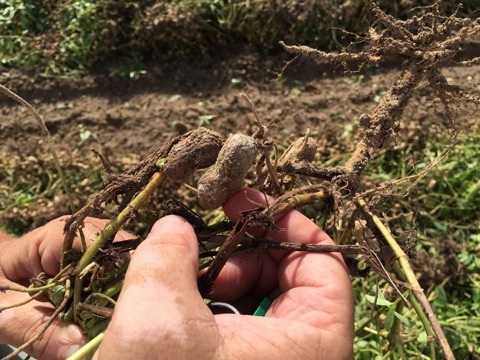 Dr. Bob Kemerait, UGA Extension plant pathologist, visited and said it does seem that the lesion nematode feeding or the subsequent entry of decay organisms in the feeding area caused some of the pods to come off prematurely. 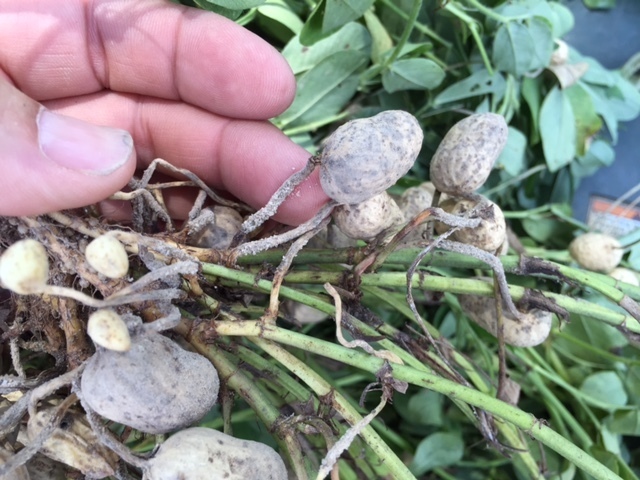 In the fields we saw peanuts that were coming off before they could be harvested due to the affected stems. Plant disease has been a big problem this year and here’s some good insight and recommendations from Dr. Bob Kemerait, UGA Plant Pathologist. Soybean rust, so very quiet for much of the season, is now much more active in the southeastern United States. For current finds of soybean rust, please see www.sbrusa.net. Soybean rust has been found throughout Mississippi and Alabama. While we have found fewer “hits” in Georgia, as of last Friday we have found it in Decatur County and then rapidly in Colquitt County and now Burke County. 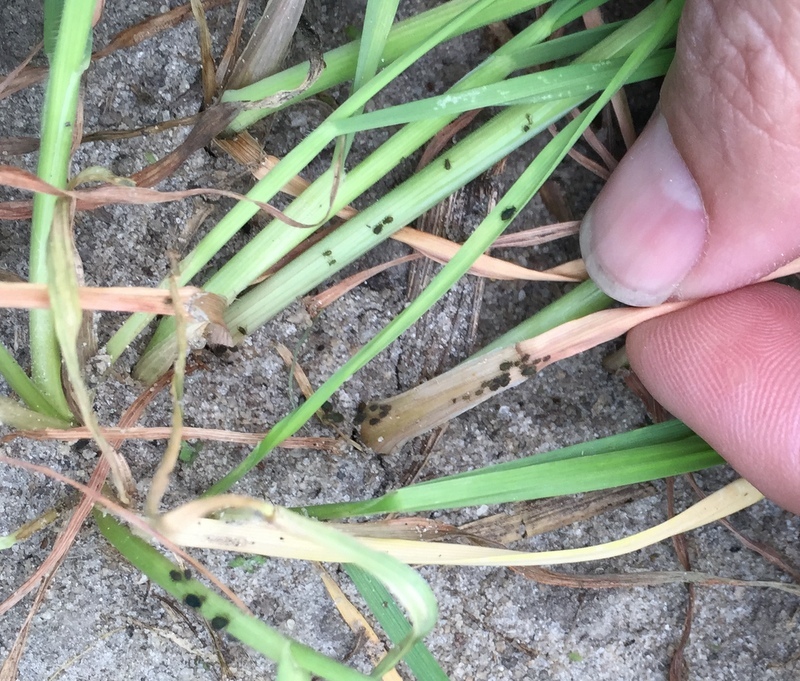 Given the general distribution in Alabama and the west-to-east distribution in Georgia, coupled with recent rains and cooler weather, I think the disease could quickly be found in any field in the state. IMPORTANT to NOTE: though the disease is finally spreading (and rapidly), we are seeing the SPREAD but the BUILD-UP is lagging behind. That is, the disease is widely but thinly scattered at the moment. With time, the disease will build until frost. Growers with soybeans that are full-seed/R6 or close to it are “safe”. Soybean fields with pods where seeds still have weeks to develop until they fill the pod are at risk. For growers who spray now, late in the season, even use of tebuconazole is likely to be of benefit. 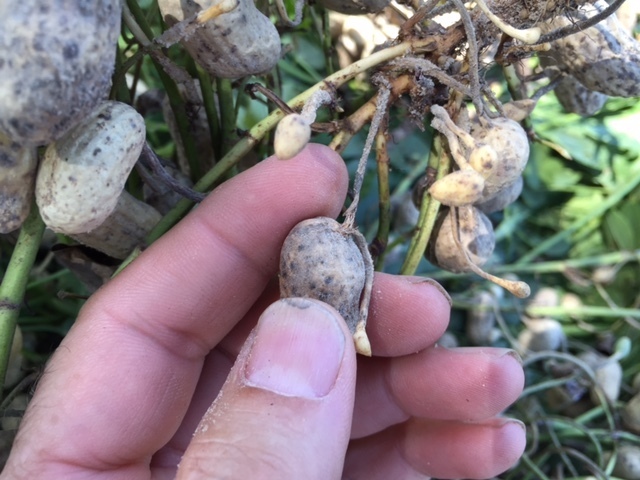 PEANUTS/White mold: Cooler temperatures should begin to help subdue a disease that has been troublesome for many, but not all, this season. 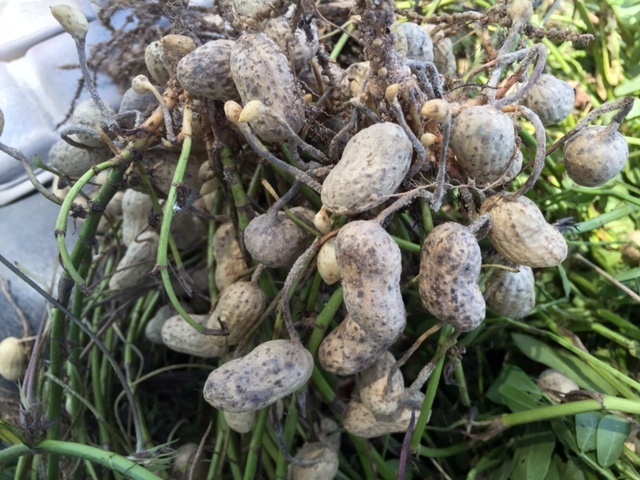 Diseases are always a constraint to peanut production in the southeastern United States, but some diseases have been especially troublesome in 2015. For reasons that are not clear, tomato spotted wilt has, for the third year in row, caused significant losses in some fields. Unfortunately, there have even been a few fields considered to be at “reduced risk” where damage from the tomato spotted wilt virus has been severe. Other diseases, especially stem rot (white mold) caused by Sclerotium rolfsii and Aspergillus crown rot caused by Aspergillus niger, have led to a continuous battle with the grower throughout the season in terms of fungicide programs and considerations for re-planting the crop earlier in the year. I believe there have been at least two very important factors. First, the season has been extremely warm; such favors the development of both white mold and Aspergillus crown rot. Add in some periods of rainfall/moisture and it is the “perfect storm” for white mold. Second, our huge acreage planted to peanut in 2015 is a certain indication that some of our peanut fields were planted on a short rotation, increasing the risk to diseases like stem rot/white mold and even Rhizoctonia limb rot and leaf spot. The 2015 season will likely be remembered as one where more effective (and, of course, more costly) fungicide programs for management of white mold were needed. 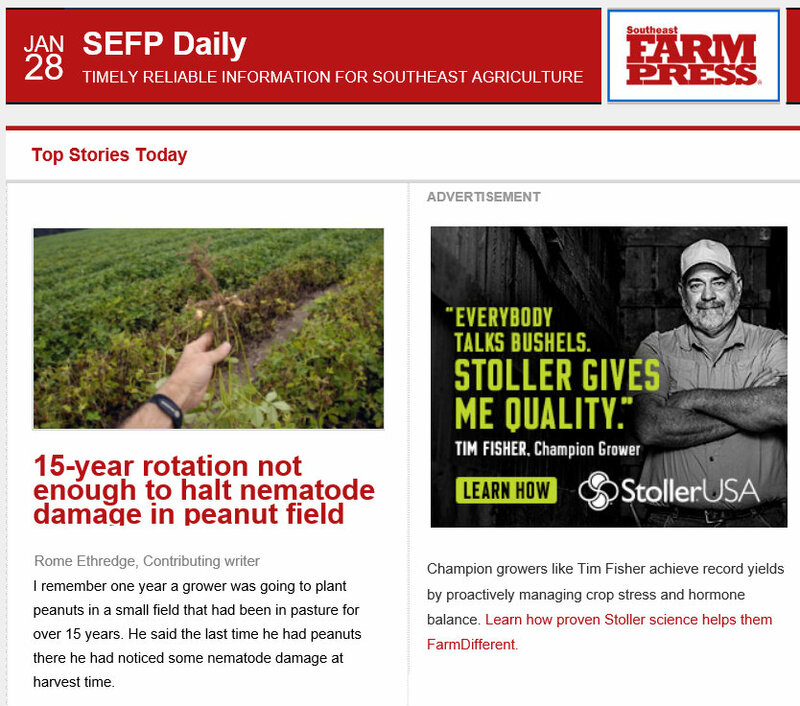 Now in September, we have four common questions with regards to disease management in peanut fields. With harvest in sight, how should I finish out my disease management program? Answer: The 2015 season has been very favorable for white mold and many growers have wisely continued to protect their crop from this disease beyond the traditional window between 60 and 105 days after planting. However, cooler temperatures anticipated as we head into September should help to slow white mold. 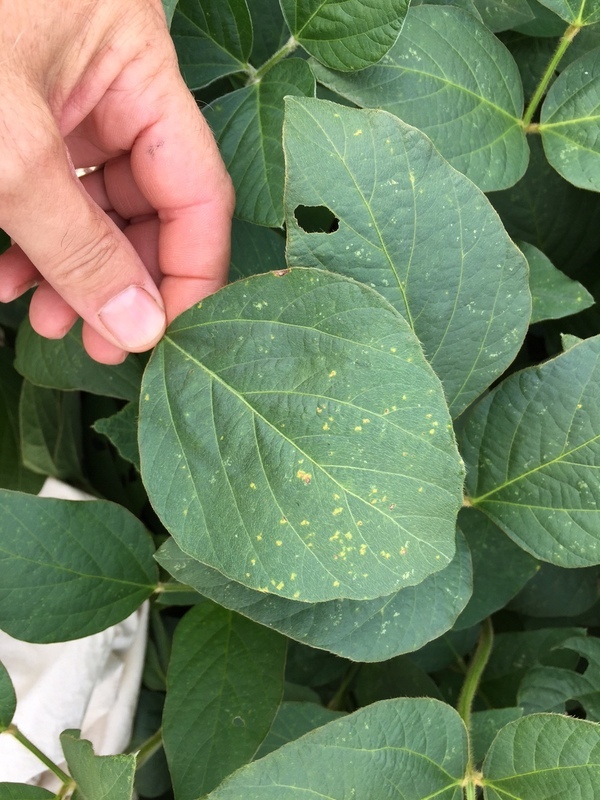 Any grower who has four weeks or more to go until harvest, except those at low risk based upon Peanut Rx, should maintain a fungicide program at least for leaf spot diseases and perhaps for white mold. 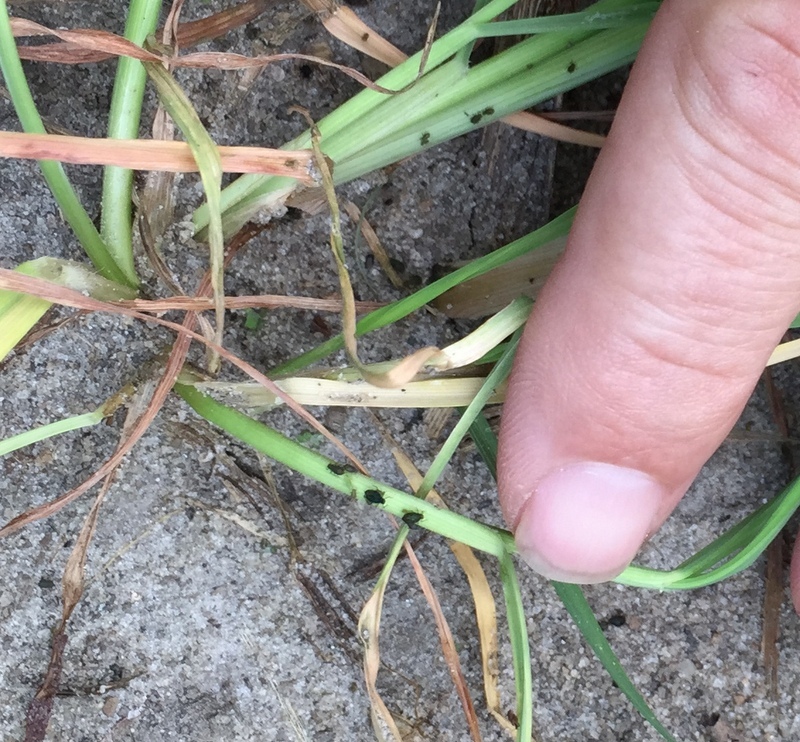 Growers with three weeks to go until harvest and without a disease problem (white mold, leaf spot or other) can likely suspend their program unless a tropical storm or other system threatens that might delay harvest. Growers with a significant disease problem may consider protecting the crop to within two weeks of projected harvest. 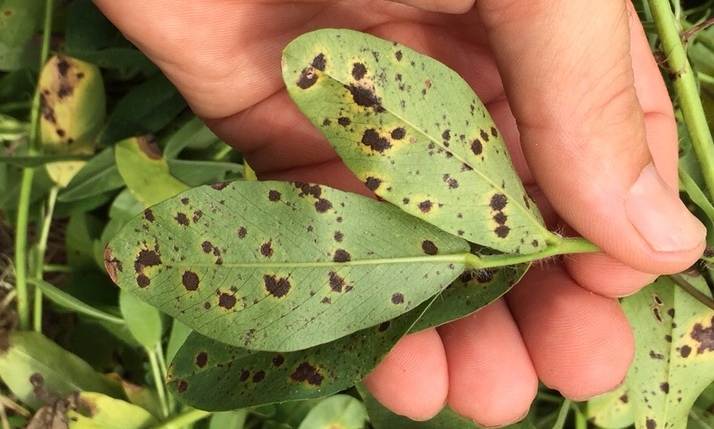 Fields with excessive levels of leaf spot or white mold demand special measures as harvest nears. (Note: in extreme cases, it may be impossible to do anything to slow the spread of disease once it is established.) Where leaf spot is problematic in a field, growers may consider including the fungicides Alto (5 fl oz/A) or Topsin M (5 fl oz/A) + a pint of chlorothalonil to manage the disease. Growers with white mold should consider continued use of a white mold fungicide, to include tebuconazole, until late in the season. With diseases in the field, should I consider digging the crop early to avoid additional digging losses? Answer: In the majority of cases, it is better to harvest the peanut crop as the appropriate maturity to insure good grades. In many cases, achieving good grade is preferable to reducing some digging losses that result from weakened pegs. Rarely do we encourage growers with tomato spotted wilt in the field to dig early. Our most popular variety, ‘Georgia-06G’, seems to be more forgiving to end-of-season defoliation than earlier varieties were. Though we want to maintain good leaf spot control throughout the season, the tolerance to yield loss Georgia-06G demonstrates when premature defoliation occurs further allows growers to keep the crop in the ground until suitable harvest. 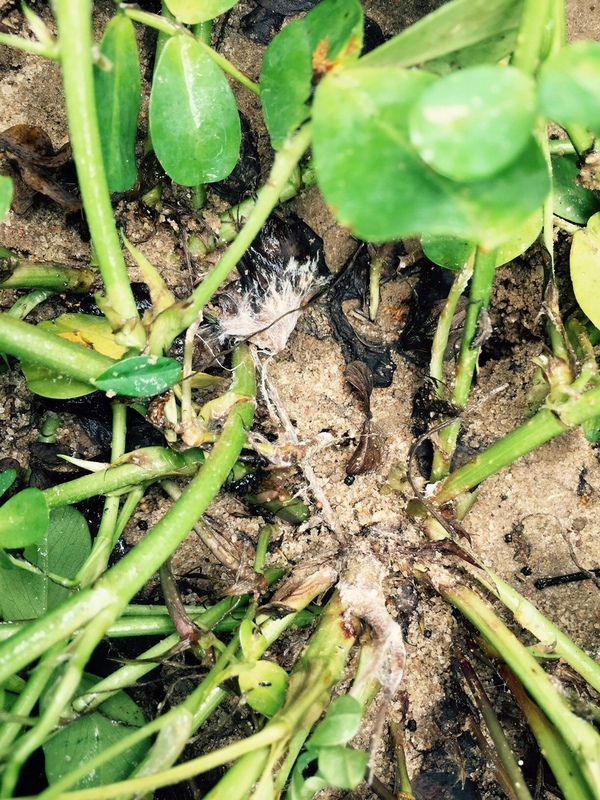 Where white mold and especially CBR are problematic, digging a crop early may be necessary as both diseases can greatly increase digging losses. If the diseases is contained, meaning that it is not continuing to spread in the field despite a number of individual plants which are affected, then I would suggest keeping the crop in the ground. However, if either of these diseases is rampant and active in the field, then it may be necessary to dig the crop to avoid significant yield loss. Late leafspot is jumping on peanuts in a bad way. I shouldn’t say jumping because it has likely been slowly building. Some folks have gotten behind on their spray schedules and with lots of watering and some cloudy, rainy weather that some folks have had, and certain varieties are more susceptible as well. Our vines have been very deep and that creates a good environment for disease in some cases. This disease can cause the leaves to fall off prematurely. If you need another protectant spray then it will pay to get it on peanuts quickly if you are seeing some of this. Here’s some photos I took today of late leafspot, the sporulation is on the leaf backs. Asian soybean rust has finally been found in Georgia in 2015. 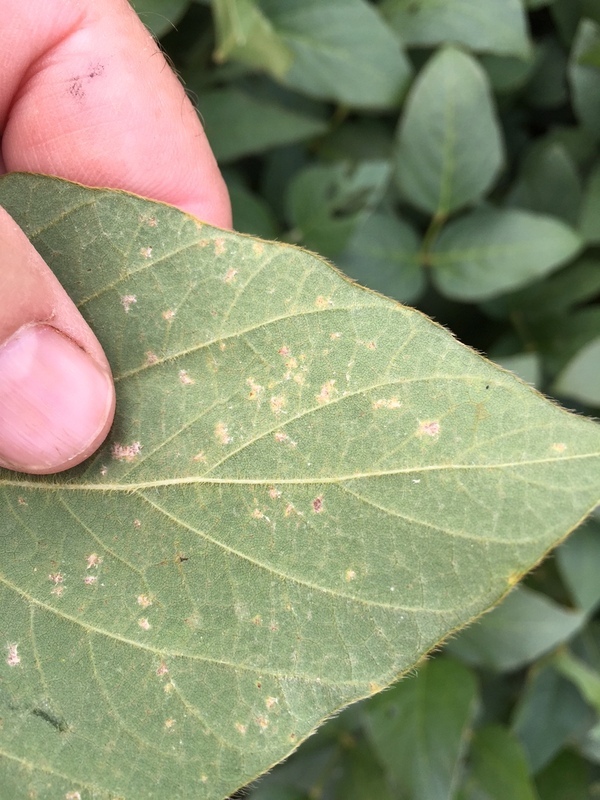 The disease was found on soybean leaves from sentinel plots in Attapulgus, Decatur County. Asian soybean rust has been slow to develop in Georgia and Alabama this year, but has been found scattered throughout Mississippi.